A Game of Romance from the Height of the Heian Period! 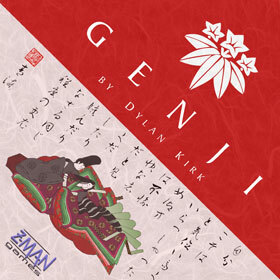 1010 AD: In the Imperial court of old Japan, one book title is on everyoneâ€™s lips: The Tale of Genji, the story of the greatest lover in all Japan. In a world where nights are filled with furtive romances, all men at court want to imitate Genjiâ€™s success. The most prolific lover will go down in history as the real Genji! You are a courtier in the court of Emperor Ichijo in a time in Japanese history when poetry and the arts reigned supreme. Your goal is to increase your reputation at court by secretly visiting Princesses and winning their hearts by writing them the greatest love poetry. At the end of the game, the player who has the most Reputation Points is the winner! Players place beginning and/or ending Poem cards on Princesses in order to match the symbols of the season, the court fashion, and the taste of the princess being wooed in order to give the poem Beauty.